During our 4 week stay in the apartment in Ponte a Serraglio we went out each and every day. Some days were big full days to Florence, Pisa, San Gimignano, Greve in Chianti, Siena, etc, other days were exploring the local villages or just going to the local markets or to one of the many restaurants in the area for lunch and or dinner. On one particular day we went to the local thermal Spa baths – Terme – right in the village of Ponte a Serraglio. We had made enquiries and learned that we needed to make a booking in order for them to prepare the bath and the room for us. We made arrangements to visit the spa the following morning and put aside a few hours to relax and indulge. It is only a 5 minute walk from the apartment to the Terme. A beautiful walk which was a daily ritual for us as our car was also parked close to this area. Here is a reminder of that beautiful walk which I loved every time we did it. Terme thermal spa was originally a hospital donated by the Russian prince Nicolaj Demidoff, so that even the poor could benefit of the thermal cures. We thoroughly enjoyed our morning at the spa. Our private room was lit with many candles and lovely soft music played. We were advised not to spend any more than an hour in the actual spa water and to take a break as often as we felt we needed. There were chaise lounges in our room which we rested on when taking breaks from the warm water. The centre offers many health benefits, treatments, massage and much more but for us, it was just a morning of indulgence in therapeutic waters that left us feeling relaxed and invigorated. People come to the Terme from all over the world. While we were staying in Bagni di Lucca, Terme had an intense weekend of relaxation, yoga, meditation, spa treatments and much more. My friend Liane spent all day Saturday and Sunday and late in to both nights at the centre. It was necessary to speak Italian to join in this weekend of activities. Also on the grounds of the Terme is chapel, Demidoff Chapel, which the Russian prince Nicolaj Demidoff built in 1825. The chapel with its round dome was made like the Pantheon in Rome. If you have the time and the inclination when you are in the area, take a look, you just may like it. It is not palatial but certainly delightful. OOooh, I love a good spa and this looks soooooo relaxing!! Thanks for sharing such a great place! A beautiful walk and a wonderful way to relax and rejuvenate! lyn, This type of relaxation treatment would have prepared your mind and body to receive and appreciate fully your next encounter in Utopia, Italy. This is actually Villagio Globale. 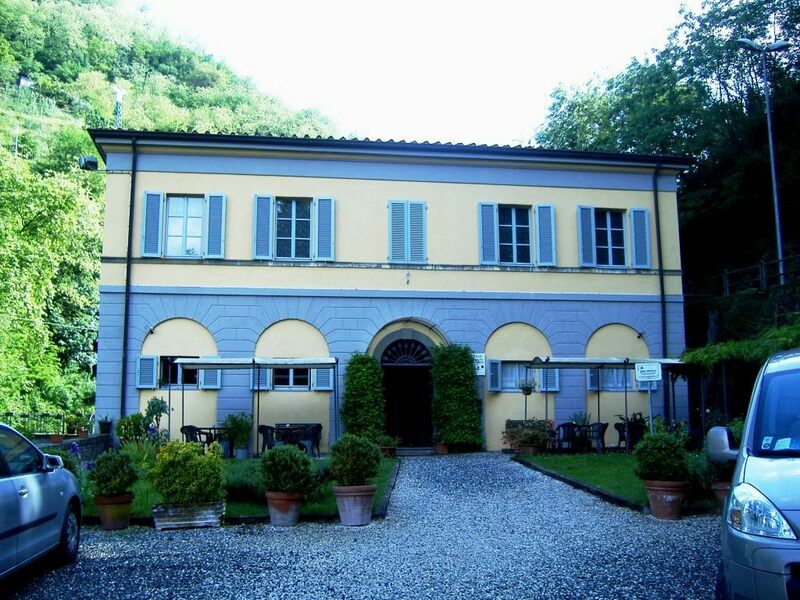 The Terme is above in Bagni Caldi where there are 2 natural steam grottoes, one of which was the personal grotto of Napoleon’s sister, Elise, when she was in charge of Lucca. I don’t suppose you took part in the primal screaming sessions at Villagio Globale. I have managed to avoid them for the last 10 years. Looks like a wonderful, peaceful place to be. Looks so relaxing..better than reflexology!